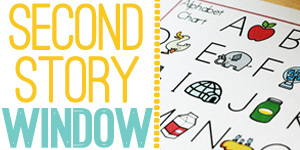 The ABCs of Second Story Window … and this Week’s Kids Co-Op Linky! Pet Peeve Any noise made while someone is chewing gum! Siblings 1 sister, 1 brother, I’m the baby! What makes you late Checking my e-mail! Xrays you’ve had Only teeth. Yummy food that you make I make a mean chocolate chip cookie. Much better at cooking desserts than any other food. favorite Zoo animal Giraffe. I’ve always loved them. Now for this week’s Kids Co-Op Linky!